I was born in and graduated from high school in Michigan. My sophomore year of college, I moved to Wyoming to attend the College of Agriculture at the University of Wyoming, where I earned a Bachelor’s degree in Rangeland Ecology and Watershed Management. I use this education everyday while I am looking at the plant demographics in my own pastures. Beautiful fiber comes from healthy animals. Healthy animals come from balanced pastureland. I now have a ranch in Clearmont, Wyoming. A very secluded and traditional area of our country. The fresh air, mountains and sunshine definitely encourage outdoor exploration. Outdoor exploration encourages the desire to bring a little of that inside so we can enjoy it longer. Fiber Art is my way of bringing what I love inside. My fascinating journey with fiber first began when I fell in love with the faces of my first four alpacas. After deciding that alpacas were the livestock my family and I wanted to interact with, it was a logical step to be interested in the product we were raising, the fiber! ​I love all types of fiber, but particularly alpaca because each fleece is unique. Each and every alpaca that calls our ranch home has enriched not only my life, but the lives of family and ranch guests who come to visit and learn fiber arts. I am very proud to have established a full service alpaca ranch with an on-site commercial fiber processing mill and teaching facility. 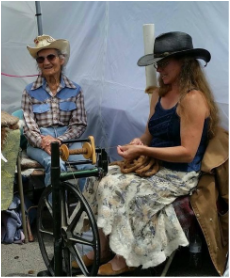 I currently teach spinning and felt-making workshops and provide consultative services to customers on practical and technical aspects of fiber animal husbandry, fiber harvesting and product development. Teaching fiber to kids and community members is not just about the fiber but also about the health and aesthetics of the animals too. I am finding inspiration for my yarn and felt projects from the world around me - from the natural world I live in, consulting with my customers, through the process of teaching, and even from the animals themselves. The process of manipulating fibers, to produce unique felts and yarns that utilize all types of fleece harvested from the alpacas, is always an exciting learning experience. I especially enjoy creating unique and delightful functional pieces from fibers that might not be seen as the most desirable from the animal, pieces such as pet beds, saddle pads, fuzzy slippers and cushiony rugs. The process of manipulating fibers begins with good management of the animals and harvesting the fibers. ​With my brand "Fiber with Flair", I journey along the entire spectrum of the fiber experience raising, harvesting and manipulating different types of fibers to create delightful functional pieces.